We can rethink symmetry and repair over recycling. This asymmetrical chair caught my attention. 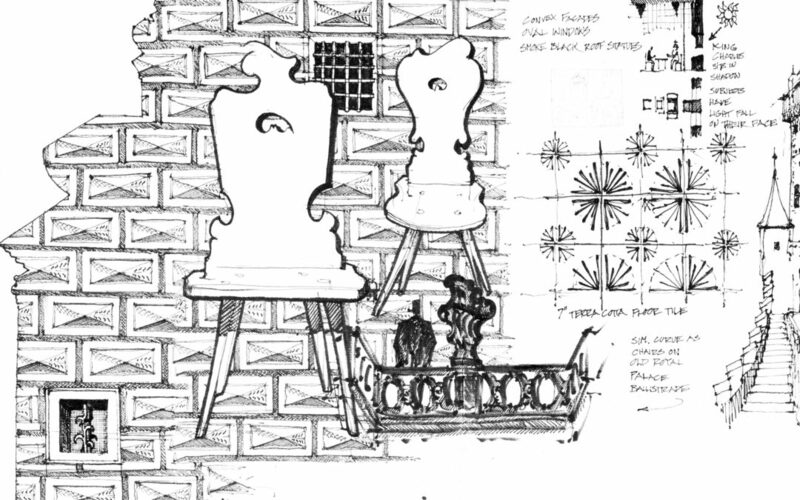 Hungarian chairs that I saw in villages were similar but often had symmetrical tulip shapes or hearts cut into the upper backrest, as in Hungary 1: Detail (d). In my travels, I was able to find local families happy to take boarders. I could see and sit in the chairs at their kitchen tables and also learn more directly about local culture. I have sat in a lot of chairs around the world, and I have never seen one that was asymmetrical. The human body is largely symmetrical, so the standard symmetry makes sense. However, I have added the chair here in this book as a springboard for thinking about what we may take for granted and the opportunities to challenge innovation in our energy consumption and production. What are we doing symmetrically that could be asymmetrical? The chairs in Hungary and the Czech Republic were carefully made and handed down over generations, with repairs as needed along the way. This is a sharp contrast to a global trend toward disposability. We have the capacity to fix more of what we use when products break down rather than discarding them. In the height of American manufacturing and productivity in the middle of the twentieth century, there were far more furniture and appliance repair stores across the country. Airfreight has reduced many products to thin gauge materials that in some cases are cheaper to replace than repair. This has added to the trend to discard rather than repair. Author and illustrator: Charlie Szoradi is an architect, inventor, and the CEO of Independence LED Lighting. He writes about many other topics related to symmetrical and asymmetrical chair and furniture design through his extensive travels around the world. If you have found this posting online, it is an excerpt from Mr. Szoradi’s book Learn from Looking that served as the inspiring seed content for this drawing share resource. For additional drawings and insights on asymmetrical chair and anomaly findings, we hope that you enjoy exploring LearnfromLooking.com. You can search via general terms such as sustainability as well as narrower terms such as furniture, craftsmanship, and asymmetrical chair.